The Transportation Safety Board of Canada finally issued their report this week concerning the loss overboad of Laura Gainey in December of 2006. You can view the entire Safety Board report on line here. Not surprisingly, the Board also leveled some substantial criticism at the sail training industry in general and has recommended increased safety and training standards and management systems be adopted by the industry. The Gainey family fully supports the findings of the Transportation Safety Board of Canada’s investigation in its report released today, and we urge Transport Canada to act on the safety concerns raised in this report. The Board’s findings support that Laura was a hard working and dedicated member of the crew, who took her responsibilities very seriously. It was in the execution of her duties, extremely fatigued and under very difficult circumstances that she was swept off the ship. We are very proud of our Laura. The report identifies several causes and factors that contributed to the accident, including the absence of effective onboard communication, the lack of safety nets and harnesses and fatigue. It suggests that the decision to sail was flawed. This report should be compulsory reading for everyone associated with the sail training industry, and it would be valuable for anyone involved in the adventure tourism industry. It is a case study for ensuring that stringent safety and risk management systems be in place. The Picton Castle has made some changes, there is still more that can be done. We would ask the owners and master of the ship to fully implement an audited safety management system, to set a standard of excellence for their industry and to rigorously maintain it. We also ask, given the mystifying and disappointing action of the Cook Islands Registry over the last 20 months, that the Picton Castle terminate this relationship and register the ship under a Canadian flag. Our goal was to find out what led to Laura’s death, and the TSB’s thorough and independent investigation has given us this information. We are grateful for this and for the closure it brings. Finally, our thoughts are often with the crew and trainees who were on board this fateful voyage in December 2006, we are thankful for their exceptional efforts in trying to recover Laura in such challenging conditions. We know they did their best with the tools they had available to them. Posted on October 31, 2008 November 1, 2008 Author Peter A. MelloCategories FotoFriday, lifeTags Foto Friday, Halloween, Senator Barack Obama, Senator John McCain4 Comments on Foto Friday – Happy Halloween! How do you and the crew feel being outward bound ahead of a storm that causes most other mariners to look for safe refuge? How do you balance the exhilaration with the concern about undertaking this type of high risk adventure with your son and daughter knowing that if something catastrophic happened to the boat there would be slight chance of rescue in the weather in which you choose/have to sail? How does Virgin get away with you undertaking these high risk adventures when Apple stock goes in the tank when Steve Jobs sneezes? Take the time to listen to all of Sir Richard’s answers, he’s quite an unique leader. I plan on posting more on that later on Weekly Leader, but for now I hope you enjoy this social media exchange. 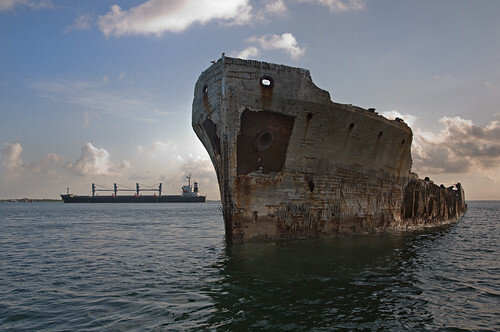 The financial crisis is creating some rough waters in the shipping industry. Evidence is mounting that the credit crunch is obstructing global trade. The drumbeats began in August when two Korean ship builders canceled orders because buyers weren’t able to produce initial payments. The beat got louder as the Baltic Dry Index of shipping rates plunged. It’s now down more than 90% from its mid-May peak. Then the Globus Maritime shipping company said on Friday it had to sell one of its ships for 29% below an earlier agreed-upon price. Globus, which is listed on London’s AIM exchange, blamed falling shipping activity and increasing difficulties in securing trade finance. Broadly, shipping and commodities markets are rife with talk that banks are refusing to honor letters of credit from other banks and holding back guarantees commodity buyers and sellers need to ship all manner of metals and soft commodities. Spurring some of the chatter early this month were the widely disseminated, gloomy remarks of a Thai shipping executive at an industry conference in Singapore. His view — that credit was frozen — was echoed by Moody’s Economy.com, which last week said stocks were piling up as cargo ships got stranded at ports pending the flow of financing. A Maersk Broker report made similar points. The near-cessation of global credit is at the root of this particular rout. Cod – The Upstart Party Fish? His dream comes as aquaculture, more craft than science until recently, appears ready to come into its own. This year, for the first time, humans will eat more farmed fish than wild fish, according to a report being prepared by the United Nations Food and Agriculture Organization. While aquaculture is nothing new, Codfarmers’ focus on a previously challenging species is. Continue reading Cod – The Upstart Party Fish? Posted on October 27, 2008 Author Peter A. MelloCategories Environment, maritime, OceansLeave a comment on Cod – The Upstart Party Fish? Here’s Branson onboard Virgin Money just after the NYC departure. There are several other video’s on Virgin Money UK’s YouTube channel. One of the most interesting things about this adventure was that you could follow the experience aboard via Richard Branson’s blog and on Twitter.